Dominique Andiran used to be a ski and sailing instructor but became fascinated by winemaking in 1988 when his uncle asked him to help out with picking that year’s harvest. His uncle only made a small amount of wine and sold most of the grapes to a large Gascony producer which was close to his vineyard. And then something horrible happened! He was spraying the vines with insecticides when he fell seriously ill and ended up in hospital. He decided while convalescing that he would either “stop growing grapes or do it differently”. So, in 2000 he changed to organic viticulture and started making his own wine rather than selling the grapes. This was a major change because of the 20,000 hectares given over to vineyards in the Cote de Gascogne, only 500 hectares were organic at the time and only a mere 30 hectares were used for producing natural wines. Dominique is an engaging, enthusiastic vigneron who is not afraid to do things differently, including leaving wines under a veil of yeast for up to a decade to see what might happen to the wine! Some of his wines therefore are very “Jura” while other are unique to his winemaking style. 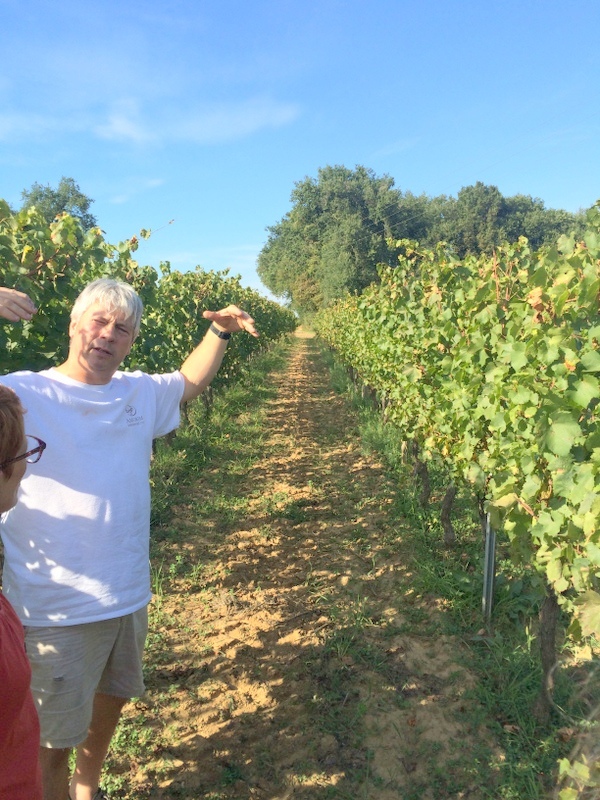 As per normal French practice, Dominique either owns or rents several plots of vines spread across many kilometres in the area of the Gers départment in South-West France around the village of Montreal-du-Gers . He has plots of Chardonnay, Colombard, Petit Manseng, Gros Manseng, Muscadelle, Ugni Blanc, Sauvignon Rose, Merlot, Cabernet Sauvignon, Cabernet Franc and Tannat. And just so you are not confused by the funny numbers at the end of each wine name, all of his wines are Vin de France and as such, there are restrictions about putting the year of the vintage on the label. However if you read the numbers backwards you may be enlightened! 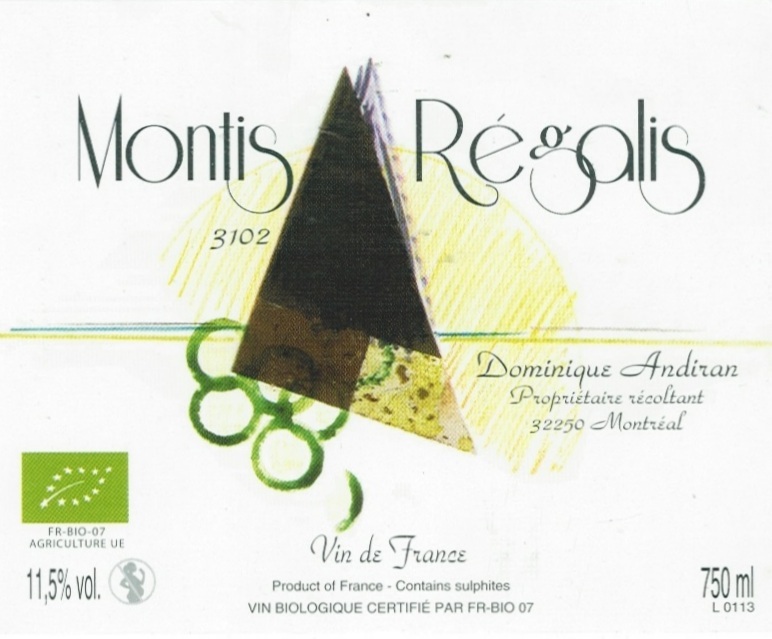 Montis Régalis is made from 100% Chardonnay. The name Montis Régalis is the name the Romans gave to the village in which Dominique lives, namely Montreal. The grapes come from a plot near Montreal with brown clay. The wine was matured in fibreglass tanks without skin contact. It is crisp and clean with fascinating floral notes and a slightly oxidative finish. It is reasonably rich this vintage coming in at 13.5% alcohol, reflecting the season. Dominique Andiran also makes a beautiful, white wine called Vain de Rû that is a delight to drink as an aperitif or match with food. He uses the local Colombard grape (a descendant of Gouais Blanc and Chenin Blanc) for this wine and it works perfectly. The grapes are grown on clay that is rich with limestone rocks which give this wine its vibrant minerality. Further complexity was given to this wine through slightly extended maceration (a little over twenty hours) which has resulted in a richer flavour and more interesting texture without over-extraction of the polyphenols from the skins. The juice was then transferred to fibreglass tanks. The wine displays an appealing freshness with hints of acacia and grapefruit. So easy for drinking by itself or with oysters, seafood or chicken or a wide range of vegetable dishes. One writer has called this wine “the Muscadet of the South-West” which is written as a compliment. And as for the name! The French love a play on words. The word rû means small stream. 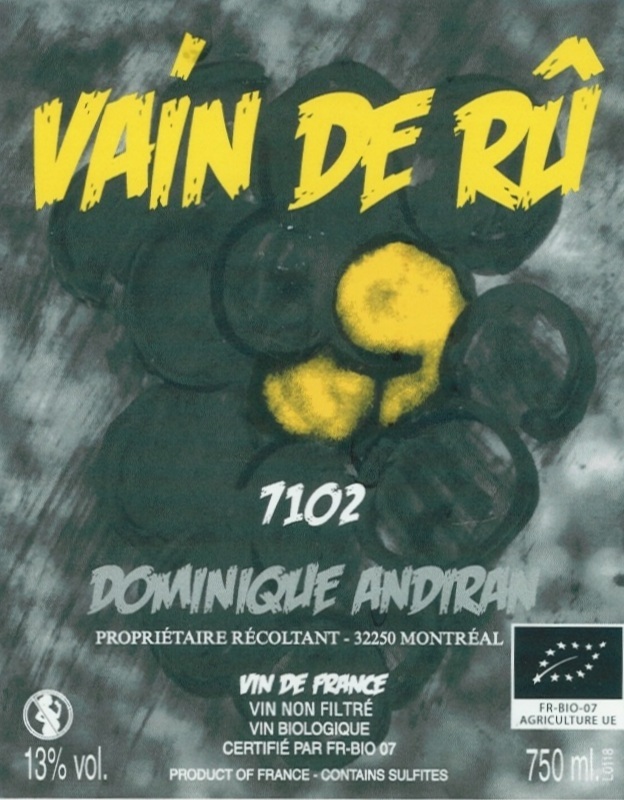 Now rû is similar to rue, the word for street where casual parties are held and this wine is perfect for casual parties, therefore he wanted to call it vin de rû. But the French appellation rules govern the size that the word Vin can be displayed on the labels and he wanted the letters to be big, so he changed it to Vain!!! 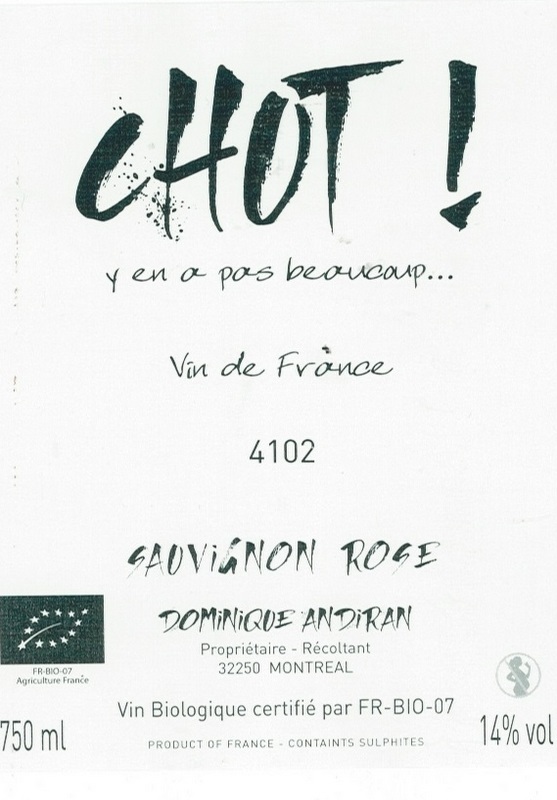 Note that the 7102 appears on the label as a code for the year of vintage as it in not permitted to put the vintage on the label of a Vin de France wine. Dominique’s vineyards in the south-west of France are reasonably close to Bordeaux and therefore Merlot is grown here as it is in the better known Bordeaux. This is a wine that should appeal to drinkers who enjoy a subtle, slightly sweet yet full bodied red wine. 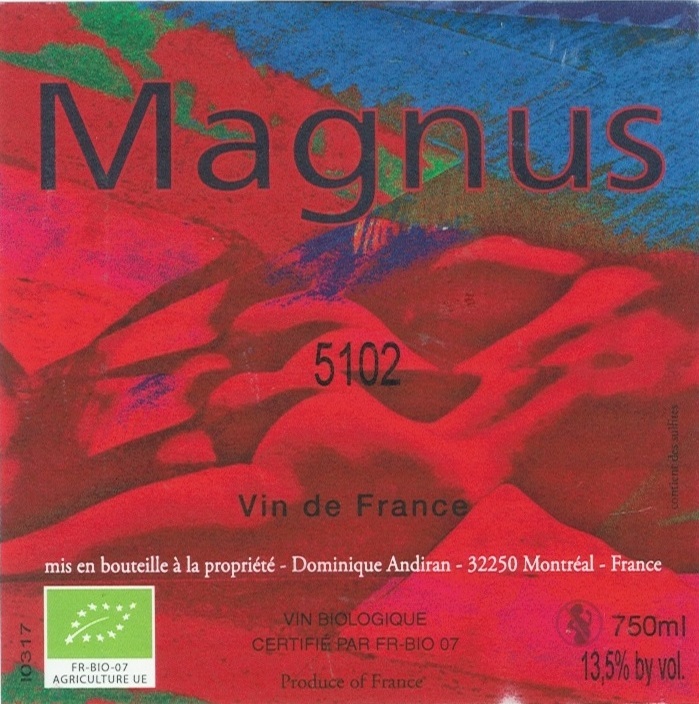 This year the Magnus is 100% Merlot (normally it is 80% with the remainder being the bold Tannat grape variety), but in 2016 Dominique had a problem with this grape and so had none to use in this wine. Chut! is an intriguing wine because it is made from a very rare grape variety that makes a beautiful wine with subtle aromas and a long finish. The grape variety is Sauvignon Rose which is so named because the skin has a soft pink colour. It is thought to be a mutation of Sauvignon Blanc that probably occurred hundreds of years ago in the Loire Valley. 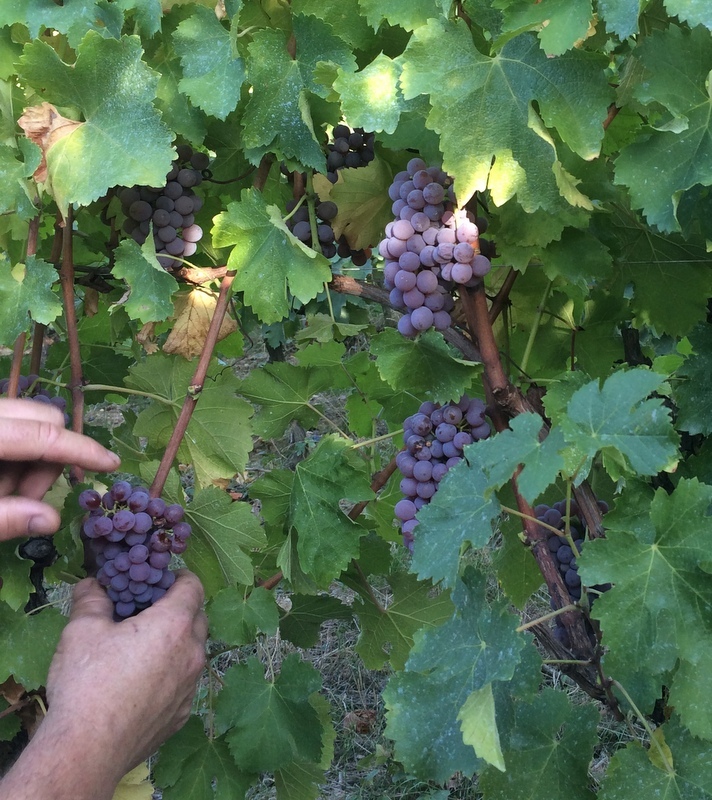 The grapes are a deep pink in colour and produce a wine with a pink hue which is not a rosé but rather a white wine. This is a very pleasant drink with a lot going on. Think herbs and flower petals and a lovely streak of minerality. The Ruminant des Vignes is a very interesting wine with an interesting back story. A fossil of a strange horse-like animal was found in the quarry in one of Dominque’s vineyards and the imagined animal was drawn by the students who examined the bones at the local university. The lecturer gave the drawing to Dominique. So, the wine got to be called Ruminant. The wine is made from Gros Manseng – a grape that is very popular in this area for making late-picked sweeter wines. This wine underwent a very slow fermentation, taking many months to complete. However the sugar level is very low at about 2.5 grams of residual sugar. It is also quite oxidative so it should be treated more like a sherry than a white wine. A bottle we sampled recently had been opened for two weeks and it was still fine. It is an intriguing and mysterious wine that is perfect as an aperitif or to accompany a range of desserts. We tried it with a sweet walnut souffle recently and it was a perfect match. Soyeux is a sweet wine made from 100% Gros Manseng, the same grape that is used to make many of the gorgeous sweet wines in nearby Jurançon. Dominique calls the wine Soyeux because he found a reference to sweet wine of the moelleux in a book quoting Henry IV and the word he used was soyeux which is the French word for silky. The wine is made with a mix of just ripe and fully ripe, shrivelled grapes with concentrated sugars so that there is a nice balance of acidity and sweetness. This wine has undergone a light filtration because the natural yeasts in the shrivelled grapes are so strong that there is a chance of re-fermentation without the filtration. We think that this is a very exciting wine which can be matched with cheese or even rich liver dishes! 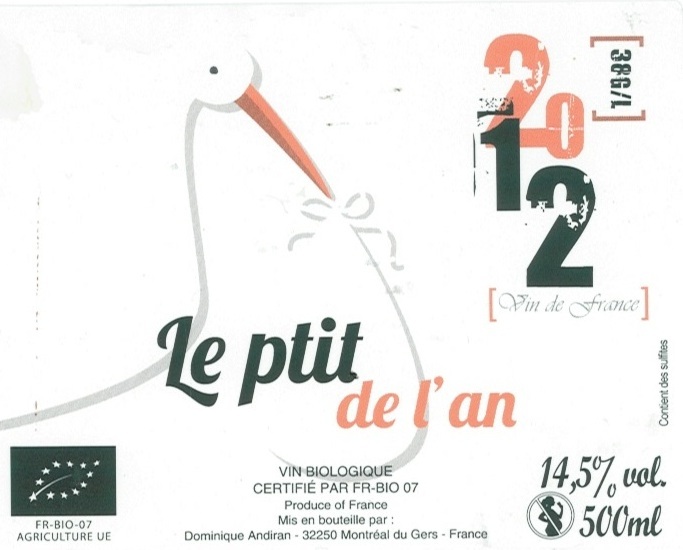 The Le Ptit de l’An is a delightful sweet wine that is sold in 500 ml bottles. It is made from a small holding of the very elegant Petit Manseng grape variety that is famous for the sweet wines that are made from this variety especially in Jurançon. The sugar content is perfect for a sweet wine at 78 grams per litre, so it is not cloyingly sweet and the lovely streak of acidity helps to keep it in balance. This is a truly beautiful sweet white wine that will match perfectly to many of the more savoury desserts being served in Australia’s leading restaurants. The name of this wine comes from the French word for dandelion (Pissenlit), because they grow freely in the vineyard from which the grapes (Chardonnay) for this wine were picked. This is an extraordinary wine. The grapes were harvested in 2006 and then seven years under a veil of yeast in old oak barrels, 9 months more than the minimum time required for Vin Jaune in the Jura. This wine can be drunk right through a meal as it is strong enough to stand up to any food including spicy foods. We only have a tiny allocation of this very rare wine.